The Seahawks Friday made official the hiring of six new coaches and the reassignment of three other assistants within the organization. The Seahawks Friday officially confirmed the hiring of six new coaches and also named three holdover coaches to new position titles. Heading the list of new coaches, whose employments were first reported in January, are defensive coordinator Ken Norton Jr., offensive coordinator Brian Schottenheimer and offensive line coach Mike Solari. Joining the trio: assistant defensive line coach Jethro Franklin, assistant special teams coach Larry Izzo and offensive assistant Steve Shimko. Franklin has 27 years of coaching experience, including 11 in the NFL with Green Bay, Tampa Bay, Houston and Oakland. He will re-unite with Norton after spending the past three seasons (2015-17) as the Raiders’ defensive line coach. He played seven games in his NFL career, all with Seattle in 1989, recording 13 tackles. Izzo begins his first season with the Seahawks after spending the past seven as an NFL coach following a 14-year playing career, winning three Super Bowls with the New England Patriots. He was the Houston Texans special teams coordinator the previous two years. Shimko joins Seattle after two seasons (2016-17) as offensive coordinator/quarterbacks coach at Garden City (Kan.) Community College, where he won the NJACC National Championship in his first season. 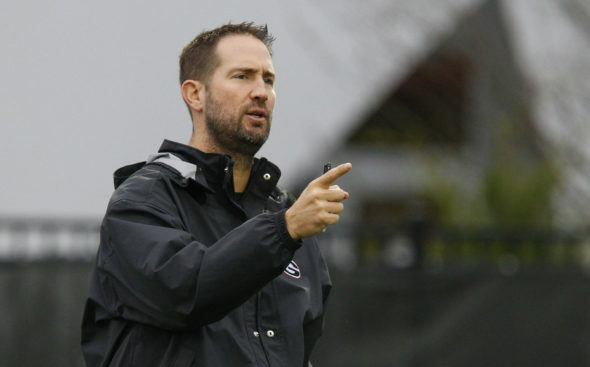 Prior to Garden City, he spent one season each at the University of Georgia (2015), where he worked alongside Schottenheimer, Western Michigan (2014) and his alma mater, Rutgers (2013). Schottenheimer is on the hot seat already. If they don’t score on their first possession of pre season, I say dump the guy. His play calling is awful. And Solari is already messing up the draft. He is terrible at talent evaluation. Just kidding! We don’t have our favorite scapegoats around anymore. The play calling and drafting is going to be so good now, we’ll make the Patriots look like the Bad News Bears. The not as good, Billy Bob Thornton version. Why wait until the first possession ends? I say if he doesn’t get first downs on the first three consecutive plays, he’s done. He’s Bevelled. Odd choice of Canales as the QB coach when he was previously the WR coach and was a WR in college. When Jim Zorn was rumored that seemed like a good fit for Russell Wilson. Wonder how much truth was to that rumor. Still sticking with the train of thought that the previous coaches were not the problem. But…c’est la vie. Hot seat is on John and Pete. Another non-playoff season or first round flame-out will result in wholesale changes. We don’t know how these coaches will mesh with the team and each other. We don’t know how many players we’ll recognize in September. We don’t know if Russ will be here, and if he is, might he be taller or shorter. In a somewhat virginous state we follow the assembly drama into September. And we still won’t know much until October . . .
John, you’re so rational. You’re supposed to have a hot take that says the Seahawks will fool everyone, or that they will fail worse the Carroll’s first two teams in Seattle. Sorry, it was kind of a flat day . . . Even if they miss the playoffs, Paul Allen will not fire John or Pete after this upcoming season . He is not that kind of owner. The wholesale changes already happened. I tend to agree with Steed on the futures of Carroll and Schneider. But this year will be difficult if current conditions prevail: Relatively little cap room and no 2nd or 3rd round picks.